Skin is much more dynamic than most realize. The major epithelial cells, called keratinocytes, engage in very elaborate signaling to many different cells. They also produce many types of cells, some gradually becoming the firm barrier cells that make skin resistant to infections and trauma. Like lining cells of the gut, skin cells must determine friendly and unfriendly microbe communities through elaborate the communication among epithelial cells, immune cells and microbes (see post). But, equally important, it is the conversation between resident microbes and epithelial cells that determines immunity at the skin. These microbes help with defense and even the repair of skin tissues. Signaling between these cells also determines which microbes will cause infections and chronic skin disease. In fact, microbe conversations with skin produce immunity. Skin is not just a physical barrier. Being the most exposed cells to the environment it must defend against physical assault and microbe attacks. With many dynamic layers, there are a large number of different microbes in the skin such as viruses, bacteria and fungus. There are many different factors that play into whether an otherwise friendly, or rather commensal, microbe will become dangerous. Factors include the existing immune defenses, genetics, and the exact locations of the microbes. Two large layers of skin—dermis and epidermis—have different microenvironments. Epidermis has multiple layers of stem cells. 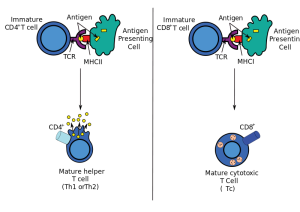 Different types of cells are produced over a month, changing into final arrangements of interconnected proteins cemented by fatty molecules into a very strong barrier. In this outermost layer special immune cells are Langerhans cells and multiple types of T cells (CD8+). Dermis below has strong extra cellular matrix with many other types of immune cells. For microbes that are living peacefully and mutually beneficially to become aggressive there has to be dramatic responses of the microbes as well as the host. It takes an extreme amount of energy to counteract many attacks from layers of immune responses, including special attack peptides (see post on antimicrobial peptides or AMPs), and multiple enzymes. Microbes must create attack molecules that allow special abilities for travel and the ability for making damage to the lining. Most will not do this unless they are in very particular locations. Skin infections are usually caused by Staphylococcus aureus and candida albicans. 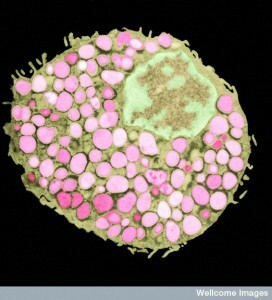 Viruses such as herpes that can live peacefully for decades also become aggressive in certain circumstances. There are unusual microbes that are brought to the skin through insect bites or with traumatic injuries of the skin. This post describes the conversations between otherwise friendly microbes and human cells and how infections can start. These conversations include master T cells. In the epidermal layer of the skin, one complex region surrounds hair follicles. Multiple elaborate layers of keratinocytes produce a physical barrier with immune defense as well. In the dermis layer there are many different immune cells present—macrophages, dendritic cells, multiple types of lymphocytes, and mast cells. Microbes live in many layers including hair follicles and glands that secrete oils into hair follicles. Microbes in the skin change after puberty to mostly fat loving types (lipophilic). This occurs because of hormonal changes producing more oils. Skin pigmentation also affects microbes. It is hard for microbes to live on the skin since there are few nutrients compared with the gut. There are approximately a million bacteria for each square centimeter of skin. Products used for cleaning the skin affect which microbes are residents. Like the gut, skin has many different local environments with different pH, temperature, oils, water, and shapes. Each attracts a different resident microbe community. Different environments also exist near glands, nerves, and immune lymph centers. It is surprising how cooperation between microbes and many levels of immunity can help with maintenance of normal skin and repair of damaged skin. One example occurs when a particular part of the cell wall of Staphylococcus epidermis (lipoteichoic acid) triggers a particular pattern recognition receptor (TLR2 or Toll-like receptor2). This stops inflammation and increases healing of wounds. In the gut, microbes actually send signals to the epithelial cell to produce the types of immunity. They operate differently in the skin. Skin doesn’t actually organize lymph tissues as in the gut. But, there is great control over the types of signals that immune cells and keratinocytes produce, such as peptides. (See previous post on the peptide signals that control immunity.) 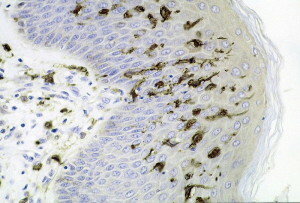 Prominent peptides in the skin include cathelicidins and β-defensins. Microbe signaling also seems to control the immune complement systems in the skin. They control IL-1 that is a powerful initiator of immune skin responses used by keratinocytes. All of these mechanisms are very old in evolution. Another effect involves signals used by microbe communities for quorum sensing (that is measuring the size of a community) that attracts particular mosquitoes with malaria. Signaling from skin microbes increases the amount of lymphocytes that are activated in adaptive immunity. This occurs in normal conditions as well as with infections. Special T cells that live in the skin respond to these microbe signals and produce IL-17 and interferon-γ (IFNγ). Signals maintain normal order and protect some particular microbes such as Candida and Leishmania major. Microbe signals are part of these immune conversations. A previous post showed how special factors in food contributed to the special T cells called FOXP3 that control autoimmune responses to food. In the skin a similar type of signaling limits negative responses and inflammation. One signal, a lysate from Vitreoscilla filiformis, produces special regulatory T cells, which inhibit other T cells during an inflammatory response of dermatitis. There are multiple other signals that suppress specific types of inflammation—such as S. aureus producing lipo peptides that bind to recognition receptors TLR6. Another example is S. epidermidis making IL-10. These produce special cells that stop further inflammation. Fat tissue in the skin is also important in immune responses. If there is S. aureus infection, cells that become fat cells increase. This makes the fat layer much bigger. Also, increases in peptides such as cathelicidin help to stop aggressive microbes. Signals are sent to attract a host of particular immune cells, including special monocytes and neutrophils. Also structural cells are involved. Another set of macrophages are called into duty. These come from special macrophages that sit in the small venules nearby and are ready to join in by passing into the tissue. Microbes that are invading can also change the types of neutrophils that are attracted. 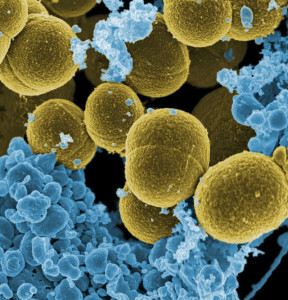 S. Aureus produces a particular toxin that kills local macrophages. Usually benign, in certain environments S. aureus has many toxins that kill neutrophils, stop complement and interfere with pattern recognition receptors. Dendritic cells are major immune cells that find and present antigens (APCs or antigen presenting cells) to stimulate immune defenses. Dendritic cells are the ones that sense the particular microbes. They bring their findings to T cells where they both decide together through signaling whether to activate and fight. There are in fact many types of dendritic cells that are particular for niches in tissues. Four major types occur in skin. One cell that brings antigens is the special Langerhans cell in the epidermis. 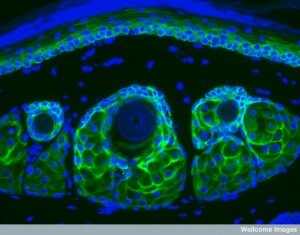 These cells either come to the skin during the fetus or from the liver. 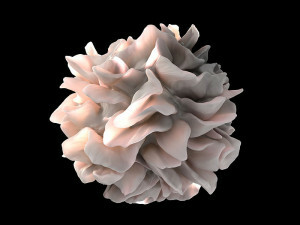 Another type of dendritic cells is called CD103. Various signals are needed to develop this cell that can function in many different ways. Special transcription factors and interferon regulatory factors are necessary to instruct these particular cells. Another type of dendritic cells that gathers antigens from microbes is called CD1c+. The fourth is called double negative and these need particular signals IRF4 and KLF4. Each of these different dendritic cells promotes very different immune responses. But, there are many other variables that are vital including the particular microbe and their signals, the particular locations and how severe the infections are. At times, a series of dendritic cells work together for optimal responses and these occur in particular sequences at different points in the inflammation. It has not been clear how microbes work with the immune system until recently. It was found that cells bring particular material at particular moments in the process. The timing of the signals produce distinct results. Even when there is no break in the skin, these processes can bring about long lasting immune reactions caused by particular microbes. 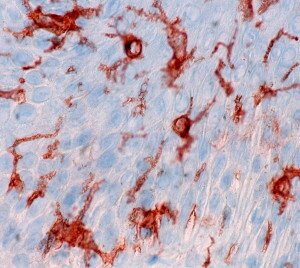 An example of timing in producing inflammation includes three distinct cells. S. epidermis activating 2 different types of T cells (CD4+ and CD8+) that produce the important cytokine IL-17. Other dendritic cells CD103 also stimulate IL-17. The third type CD11b+ produce IL-1. All of these cause different effects at different sequences of the inflammation. In hair follicles that are covered with microbes, dendritic cells send arms into these masses of microbes and capture pieces and products of the microbes that they present to T cells for refinement of their responses. In places where the skin is not so firm, microbe products diffuse and are captured by dendritic cells or even keratinocytes. Specific presentation of particles occurs during the entire inflammation process with distinct types of dendritic cells for each. Fungus exists as buds on the surface. But, dangerous types include pseudo hyphae deep in the dermis. When a cut occurs to the skin, surface Langerhans cells stimulate T helper 17 cells producing IL-6. This is necessary to protect against further infection from the fungus. Deep in the dermis pseudo-hyphae of C. Albicans do not stimulate T 17 cells from Langerhans cells, but CD103 dendritic cells produce T helper 1 cells with a diferent powerful cytokine IL-12. 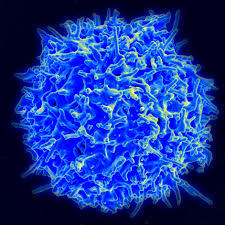 There are other T cells that are triggered by other dendritic cells. There are other complex examples of interacting cells. Skin infection with L. major stimulates Langerhans cells to produce the special T cells used in the gut to avoid food reactions, FOXP3+ T regulatory cells. This decreased the amount of T helper 1 cells. 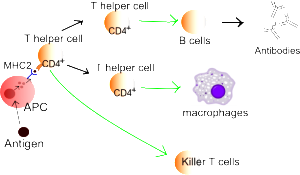 The dendritic cell CD103 produced IL-12, which increased T helper 1 cells that are needed for immunity. It was the Langerhans cells that produced these T cells. With HSV-1 infection CD103 dendritic cells produce CD8+ T cells for immunity. Factors in the specific tissues also have major influences on whether inflammation and infection will occur. These factors maintain the tissue by stimulating dendritic cells in particular ways. Vitamin D3, cytokines such as TGFβ and aryl hydrocarbons (discussed in a previous post) can stimulate dendritic cells. Recently, signals from neurons also stimulate dendritic cells in various ways. In research related to psoriasis, receptors on pain fibers in the skin have interactions with dendritic cells that produce IL-23 and local activity of IL-17. The fungus C. albicans trigger neurons in the skin for sensation that then secretes the neuropeptide calcitonin gene related peptide or CGRP. This produces IL-23 from dendritic cells. This then works with IL-17 to protect the skin by producing special T cells called γδ T cells. When dendritic cells eat microbes such as white blood cells that are infected with L. major, they lose the capacity to stimulate special T cells. Microbes have a major effect on maintaining tissues and modulating immunity by controlling other microbes. When patients have deficient immunity, normal microbes become dangerous, so that normal immune conversations with microbes are necessary to maintain normal order. More study has been done on the gut than skin, which is just now being researched. In the gut it has been shown that under normal conditions extensive communication must occur between microbes, immune cells and the epithelium. This is very different than previous thought. It was thought that immune cells just ignored resident friendly microbes. In fact, communication is necessary to control both the immune responses and the microbes dangerousness. The conversations in the gut include T helper and regulatory cells and immune globulins and cytokines. The gut is complicated by the fact that microbes are necessary for digestion. What is surprising to current research is that these conversations occur with no inflammation at all. Microbes do stimulate very particular types of T cells. In the skin, specific microbes can alter very specific immune cells. S. epidermidis stimulates very specific T cells that produces IL-17A. Only in the niche in the skin, these particular T cells stimulate keratinocytes to produce the signal AMP that protects the skin from fungus. This occurs with the help of the dendritic cells. The local dendritic cells help maintain the status quo without triggering other types. With constant exposures to the skin, the status quo must be actively maintained. T cells that stay in the skin are conversing with particular resident microbes over time. When a completely new type of microbe particle is picked up, resident species work together to maintain the situation. 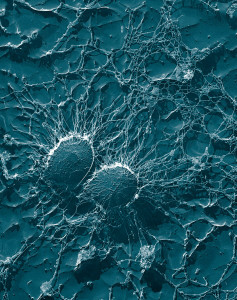 By responding to the diverse new microbes, resident cells reinforce the ongoing safe situation. The skin has some of the same T cells that maintain balance against food allergies—FOXP3 T reg cells mute reactions to food particles. These special T cells are active from the time when hair follicles form in the fetus. Most exist in the dermis near hair follicles, which is the largest accumulation of microbes on the skin. These cells serve a similar purpose in the skin as the gut. They limit reactions to the bacteria in the hair follicle niche. They create an unusual situation where a lowgrade infection can occur that then triggers immune responses to limit any further infections of this type. T regulator cells help resident microbes to stay there and also help repair any damage and small skin infections. Other factors control inflammation. Neuron factors and toxins from microbes also limit infections. There are several types of γδ T cells, that are increased in psoriasis. These T cells produce IL-17. They specialize in recognizing lipid molecules, often the material made from microbes. They are also triggered by signals that produce inflammation such as IL-1 and IL-23. They are produced during inflammation and sent to many sites where they stay for long periods of time. They are able to release a host of cytokines and are very active in microbe stimulated infections, including releasing the powerful and influential IL-17. Fungus is greatly influenced by IL-17 and γδ T cells protected against them. The skin has one of the largest concentrations of T cells in the body. Most of these are resident memory cells (RM). RM cells specialize in reactions to specific microbes that are resident friendly species or have caused infections. This line of T cells is different in lineage and function from other T cells, including more general memory cells, that travel throughout the body. Virus infection stimulates CD8+T-RM resident memory cells in the epidermis. CD4+ T –RM resident memory cells exist in the dermis. This second cell needs constant signals to function and therefore is related to the resident friendly group of microbes. These cells respond to the situation that is constantly changing and keep up relationships with specific friendly microbes. T cells that are stimulated by microbes travel to the outer epidermis and become CD8-RM resident memory cells. This cell undergoes a maturing process triggered by a number of different signals including the vital cytokine TGFβ. 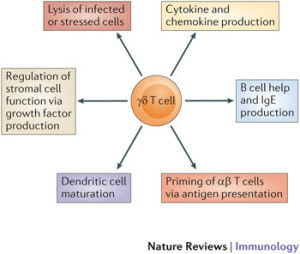 The resident memory T cell needs signals from several cells to make its way to the outer barrier regions of the skin, including the cytokine signal IL-15. Outer layers of keratinocytes create the strong barrier of the skin. These mature cells are needed to signal to resident T cells to maintain them. CD8-RM cells often stay near the very regional focus of the viral infections. It is an unusual form of detailed spatial memory that entails exact locations on the skin. Resident memory T cells take on the characteristics of dendritic cells. It is unusual that a T cell can look for microbes by themselves without the necessity of dendritic cells bringing material. Local resident T cells use many devices to contain infections. They can become killer cells if need be. 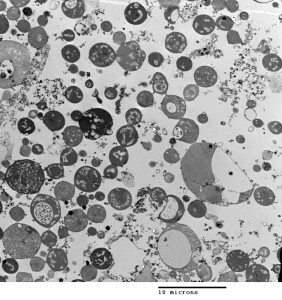 They produce granules that can break apart microbe cells. Granules can help neurons that have been infected by breaking down the ways viruses multiply in neurons. They can produce cytokines that directly affect infected cells. They can produce signals that alter the entire environment. But, this can upset the balance and cause other problems. Changes in resident skin microbes can affect inflammatory diseases. S. aureus presence is related to atopic dermatitis. Also Staphylococcus spp. is increased in dermatitis. Increased bacterial species occurs in psoriasis. 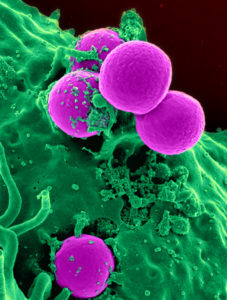 S. aureus has many different effects in triggering a variety of toxins and cytokines. It can stimulate CD4 T cells to make IL-17. In acne there is one major microbe Propionibacterium acnes. In fact, the production of infections is very complex and involves communication between specific microbes and immune cells as in the gut. Also, genetic differences, metabolic syndromes and inflammation states all determine whether disease will occur. Immunology has changed from discussing just the complexity of the lymph nodes to finding specific environments where the immune cells interact with the local cells and microbes in different specific ways. In the skin as the gut, immune and inflammation responses are totally related to communication with the specific microbe species. As with all other aspects of life, it is the signaling between cells that determines whether microbes on the skin will become dangerous or stay as friendly resident cells. In the gut, this conversation produces very particular lymph centers. In the skin the hard barrier of mature keratinocytes and the lack of nutrients produce very different microenvironments and different immune responses. The greatest concentration of microbes is in the hair follicles. The conversation between microbes, keratinocytes and immune cells do not produce lymph nodes in the skin, but rather particular types of individual traveling immune cells. Skin has the greatest concentration of resident memory cells in the body. These cells are tied to memory of exact locations that had specific infections. 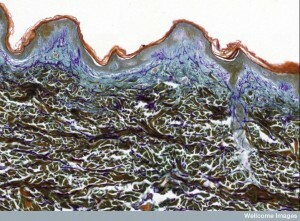 The skin is another example of intelligent communication between individual cells determining health and disease. This entry was posted in Blog, Cellular Intelligence, Microbes and tagged Microbe signals determine immune cells in skin, Many types of dendritic cells in skin, Many types of T cells in skin, Skin determined by conversation of microbes and human cells. Bookmark the permalink. Intelligent communication. Is there any other kind? Although necrotizing fasciitis may be caused by an infection with one or more than one bacterium, in most cases, the term flesh-eating bacteria has been applied to describe infections caused by the bacterium known asStreptococcus pyogenes. The term flesh-eating has been used because the bacterial infection produces toxins that destroy tissues such as muscles, skin, and fat. 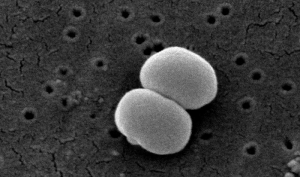 Streptococcus pyogenes is a member of the group A streptococci, a group of bacteria that are commonly responsible for mild sore throat(pharyngitis) and skin infections. 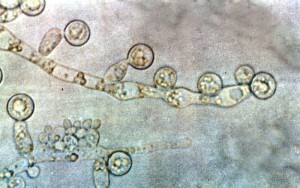 Rarely, this form of strep bacterium causes severe illnesses such as toxic shock syndrome and necrotizing fasciitis. Most infections with group A streptococci result in mild illness and may not even produce symptoms. So,what happened, or failed to happen in the case of necrotizing fascitis?